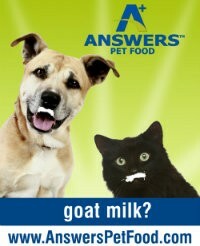 If your animal suffers from digestive upset, we highly recommend giving raw goat milk a try. Raw goat milk offers a host of benefits to your pet. Raw goat milk requires no work from the digestive apparatus. It contains over 60 enzymes, including lactase, to prevent lactose intolerance. It has small proteins and fat molecules that make for easier digestion. Raw goat milk is more buffering than over-the-counter antacids. The naturally occurring probiotics (good bacteria) and added probiotics in their natural growth medium that are in goat milk provide a broad spectrum of nutrients, including enzymes and vitamins. Bacteriocins, which are produced by the probiotics in the milk formula, are substances that can inhibit pathogenic bacteria, such as Salmonella, without harming good bacteria and body cells. A 2000 study led by Dr. Chitra N. Wendakoon of the University of Alberta, Edmonton, found fermented milk products can kill Helicobacter pylori, the ulcer-causing bacteria often associated with inflammatory bowel disease. Biofilm is produced by microbes and cancer cells for protection. It can prevent probiotics from populating the gut and prevent proper absorption of nutrients. Raw goat milk has over 60 enzymes that can help to break down biofilm. Gut flora includes the microbes, bacteria, yeast, viruses, and protozoas that naturally populate the digestive system. The type of microbes (good or bad) populating the gut is directly related to what the pet eats. Gut flora influences 84 percent of a pet’s immune system. The proper gut flora can produce not only necessary vitamins, but antibiotic, anti-viral, and anti-fungals required for the body to heal itself. Supporting a pet’s normal gut flora by feeding raw goat milk can help prevent, treat, and cure many ailments. Plus, according to Dr. Mercola, probiotics provided by fermented food, like Answers Additional Goat Milk Formula, populate the digestive system 100 times better than probiotics in pill or powder form. If you're interested in giving raw goat milk a try with your animal, stop by the store to pick some up!